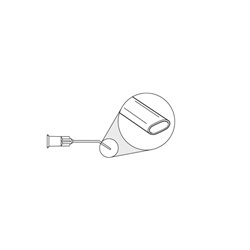 Disposable Nucleus Hydrodissection Cannula with 32-degree angled shaft, 8mm from bend to tip. Cannulas are available in 23 gauge to 30 gauge sizes with flattened, smooth, oval-shaped tip. Overall length: 22mm. Sold 10 per box, unless specified otherwise. 25 gauge. Sold 100 per bag.